Richard Eugene Ekstrum, 83, of Kimball, South Dakota, passed away Sept. 11, 2015, at Sanford USD Medical Center in Sioux Falls. Richard Eugene Ekstrum was born on a farm north of Kimball Sept. 5, 1932 to parents Carl and Caren (Johnson) Ekstrum. When he was 4 years old, they moved to a farm south of Kimball where he grew up with 4 brothers and one sister. Richard's education included country school through the eighth grade. He graduated from Kimball High School in 1950. On August 12, 1962, Richard married Agnes Arhart. They were blessed with 2 daughters, Lori and Marcee. When it was evident farming was going to be his vocation, Richard was determined to make the best of it. He eagerly accepted challenges and new technology knowing the greatest rewards are afforded those who are on the cutting edge of new practices. The farm, with brothers Duane and John, led the way in the confinement production of hogs starting in the late 1950s and continues to be the main enterprise of the farm. They adopted artificial insemination of beef cows in 1962, which is a practice still used on the farm. In his "retirement," he farmed with his nephew, Clay Ekstrum. While Richard thoroughly enjoyed farming, he felt a need to expand his horizons. He did that by accepting responsibility beyond the farm. In the late 1960s, Richard helped found and organize the SD Pork Producers Council. After spending several years with that group, he became involved with Farm Bureau. 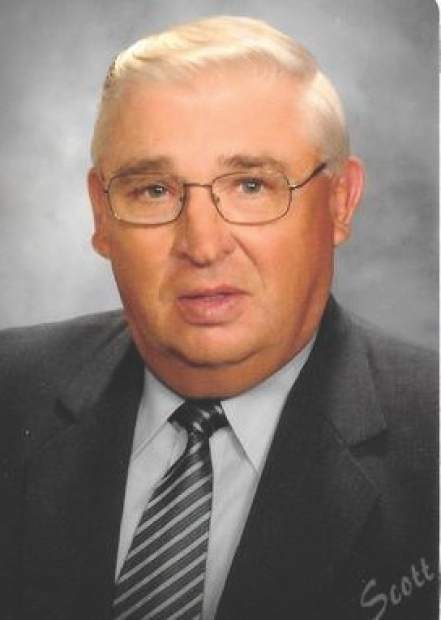 In 1975, he accepted the position of President of South Dakota Farm Bureau, a position he held for 20 years. He served on the American Farm Bureau Board for 10 years and three years on its six member Executive Board. Through his affiliation with Farm Bureau, he had the opportunity to meet Gerald Ford, Ronald Reagan, and George Bush, Sr. He served on advisory committees to 3 Secretaries of the United States Department of Agriculture, which opened the door to world travel. Richard traveled the world extensively, visiting over 40 countries, many with his daughter, Lori and sister, Karlene, reaching all 7 continents. Locally, Richard recognized the need to find quality water for our homes, towns and farms. In the early 1970s, he was part of the effort to organize the Aurora-Brule Rural Water System. He served as chairman of the board of directors for over 40 years and until the time of his death. The church was always an important part of his life. He felt it was his responsibility to accept leadership roles and try to encourage growth. In the late 1990s, he initiated an effort to secure funds to build a new Protestant Church in Kimball, which was completed in 2003. That same year, he accepted an invitation from the Bishop of the South Dakota ELCA to chair the Answer The Call program, a statewide effort to raise $3 million to recruit seminary students, help pay for their education costs and help reduce education loans once they were ordained. He was inducted into the South Dakota Hall of Fame for his contributions to agriculture in 2003 and later became a member of the Hall of Fame Board, serving as President for several years. Richard's philanthropic spirit is evidenced by many charitable contributions. He was responsible for establishing school scholarship programs both in his home town of Kimball and statewide. In 1962, Richard was chosen recipient of the Outstanding Young Farmer Award. Governor William Janklow declared November 15, 1995 as Richard Ekstrum Day in South Dakota. Richard's parents taught the value of a good work ethic, discipline and honesty. He learned at a young age to accept responsibility and to be accountable for his actions. Those attributes remained throughout his life. His father rewarded his work by taking him fishing and hunting, hobbies that lasted a lifetime. Richard enjoyed many years of fishing trips to Canada and Alaska with his brothers and friends along with annual pheasant hunts at the farm. Richard felt he was privileged to live a quality life because those who went before him left him such opportunities. It was his responsibility to pass on and to try to improve those opportunities. Richard is known for saying "Of all the hats that I wear, I like the one of being a farmer the best." Grateful for sharing his life are: his wife of 53 years, Agnes, Kimball; two daughters: Lori (Kevin) Quimby, Sioux Falls, and Marcee Ekstrum, Sioux Falls; three brothers: Duane (Sheryn) Ekstrum, Kimball, Charles (Nancy) Ekstrum, Philip, John (Jill) Ekstrum, Kimball; a sister, Karlene Morris, Pasadena, California; and many cousins, nieces, nephews and friends. Richard was preceded in death by his parents; brother, Donald Ekstrum; sister-in-law, Jane Ekstrum; and brother-in-law, Robert Morris. Funeral Services were Sept. 15, 2015 at Kimball Protestant Parish. A Committal Service followed at Kimball Community Cemetery. Visitation was Sept. 14, 2015. In lieu of flowers, memorials in Richard's honor may be directed to: Kimball Protestant Parish, PO Box 340, Kimball, SD 57355 or SD Hall of Fame, 1480 S. Main St., Chamberlain, SD 57325. Mount Funeral Home of Kimball is assisting with arrangements. Expressions of sympathy may be extended to the family through mountfuneralhome.com.